At the Lent Course run by one of the priests at my local church last week, we were shown these two films urging the cancellation of the crushing debt of the Developing World. The second video features a number of famous faces. The only two I recognised were Alun Michael, who amongst other things has starred in the series about a group of elderly rozzers solving old crimes, New Tricks, and the comedian Marcus Brigstocke. Both show its fundamental iniquity. The second video actually makes you question our collective priorities and the whole moral foundation of the banking system. After all, when the money given to bail out AIG is £170,000,000,000 + – the amount equal to the whole of Africa south of the Sahara, it’s a blindingly fair and good question why we are giving money to these banksters, but not willing to cancel such a terrible financial black hole to the world’s neediest peoples. And there’s another disturbing statistic in there: for ever pound given in aid, we get seven pounds back. As our priest said, ‘It makes you wonder who’s carrying whom.’ Indeed. I used to do voluntary work at the former Empire and Commonwealth Museum in Bristol. One evening there was a presentation given by a man, who had traced the early route in southern Africa used by one of the great Victorian pioneer explorers. He said at one point he had been taken ill, and had had to be carried across one stretch of the country by one of their African crew. He stated that at the man stopped carrying him, because he became acutely uncomfortable about the situation and how it resembled, metaphorically, Africa bearing the West. After watching those videos, I’m convinced that the reason it’s allowed to go on, is because it’s just another way of the rich West screwing money out of the Developing World, just as we did under imperialism. It’s a disgusting situation, whether you’re religious or not. And I hope whatever our personal religious beliefs, we can find some way of changing this situation, before too many more people die in the poverty, squalor and starvation that this toxic debt is creating. I’m aware that I haven’t been blogging as much as I should have over the past few weeks. As I’ve explained, I’ve got caught up in other things. I’ve also been too depressed and angry at the government and its smarmy, self-satisfied aristocratic servants that I really haven’t been able to face sitting down at the computer to write about them. This little piece of historical fact was so telling, that I felt I had to put it up. It shows how little official attitudes towards the deaths of the poor and powerless have changed in certain sections of the establishment since the days of slavery. I used to do voluntary work in the Empire and Commonwealth Museum when it was here in Bristol, helping to catalogue the materials they had on slavery and the slave trade. One of the official government papers published in 1831 describing the reforms the British government was trying to push through the Caribbean legislatures to improve the conditions for its enslaved peoples contained the official correspondence on cruelty cases in St. Kitt’s and Nevis, and the failure of the islands’ grand jury to convict Walley and Swindell, the manager and attorney of Stapleton’s Estate belonging to Lord Combermere. Walley and Swindell had been prosecuted for the murder of three slaves – Bolam, Davis, and Cousins; the manslaughter of a fourth, Innes, and the maltreatment of three more, Frances, Monmouth and George Tobin. The Grand Jury, however, had thrown these out, declaring them to be ‘frivolous and vexatious’. See the government blue book – House of Commons Papers 1831: The Slave Population 1831. Sound familiar? I’m afraid it does! I’ve blogged repeatedly about how Mike over at Vox Political/ Benefits Bloodbath, and the other Left-wing bloggers demanding the release of the government’s stats on the numbers who’ve died after ATOS declared them fit and well have had their requests turned down. And in their case, the government’s excuse had been exactly the same – the requests were vexatious. Vexatious: That’s how a jury composed of planters and other slave owners in the 1830s Caribbean described their government’s attempts to prosecute two of their members for the murder and abuse of seven human beings, who were denied their freedom as the private property of their owners. It’s how the DWP under the Gentleman Ranker, Iain Duncan Smith, serving a government led by two aristos, Cameron and Osborne, describe attempts by ordinary citizens to hold them to account for those killed by their policies. I’ve blogged along with Mike, the Angry Yorkshireman, and so many others, about the way workfare has effectively become a form of slavery. This provides further proof that Cameron, Osborne, IDS and co really are throwbacks to the 19th century slavemasters, jealous of their power of life and death over their workers. There is one difference, however. In the 19th century even some of the most reactionary of the British Tories could be determined to end slavery. In those cases, the head of the Colonial Office, Viscount Goderich, along with the Chief Justice for Nevis, George Webbe, and Presidents Maxwell of St. Kitt’s and Maynard of Nevis were angered by the failure of prosecution to demand further action and changes to the law in order to prevent further miscarriages of justice. This present Tory crew and their media cheerleaders are determined to do the opposite, and make it even more difficult for ordinary people, the powerless, the disabled, to hold their masters to justice. And if we let them carry on, there will be slavery, real slavery, in 21st century Britain, presided over by a cruel, indifferent and sneering establishment. This week I’ve been blogging about the contribution of non-White servicemen and women and that of Chinese labourers to the imperial forces during the First World War. This has partly been because, as Guy Debord’s Cat reported earlier this week, one of the Nazi splinter groups of the Fascist Right has been selling poppies and other merchandise. They’re trying to cash in on the patriotic mourning in Remembrance Day, and appropriate it for White Nationalism. This is in complete contradiction to history. I’ve described in my previous blog posts how the scholars at the In Flanders Fields Museum in Ypres have researched and teach the multicultural composition of the British imperial forces. The former British Empire and Commonwealth Museum in Bristol even had a display on it. After nearly a century of scandalous neglect, there is now a monument to these brave men and women amongst the monuments to the White fallen in Flanders. Radio 4 has also broadcast a programme on the contribution of the Chinese labourers, and tomorrow at 9 pm, Radio 2 will also broadcast a show on the Indian squaddies, who did their patriotic duty and joined up. I found this recruiting poster for the Indian Army in one of the history books I’ve got here at home, simply entitled History of the World: the Last Five Hundred Years, edited by Esmond Wright, and published by W.H. Smith in 1984. The text reads: ‘This soldier is guarding India. He is guarding his home and his household. 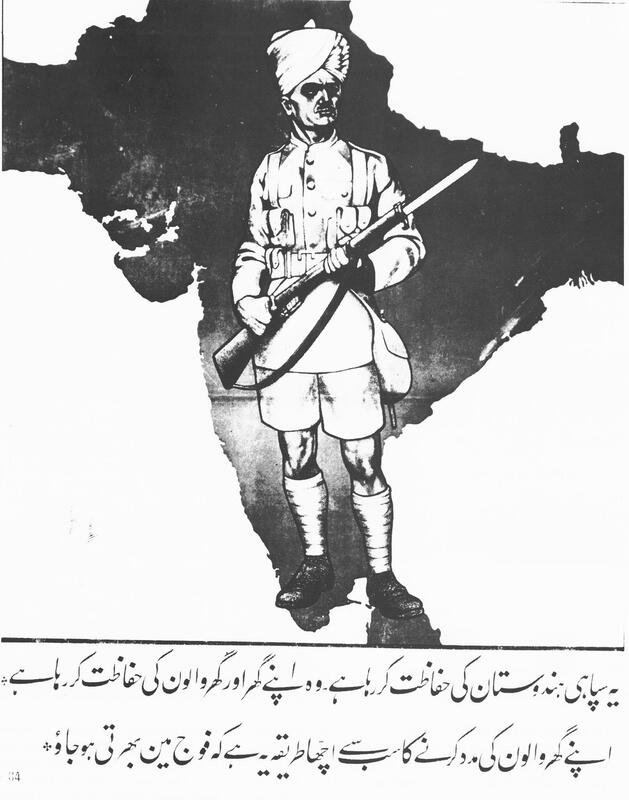 Thus we are guarding your home and you must join the army.’ While the British exploitation of India under the Empire is a fact of history, this shows without doubt that Indian soldiers fought in the imperial forces for their homeland. It disproves any attempt to claim Remembrance Day by White bigots for themselves. Earlier this week I reblogged a piece from Guy Debord’s Cat on the way the Nazi right were trying to cash in on Remembrance Day. They were selling poppies and merchandise with the intention of appropriating this act of commemoration for the fallen as a unique symbol of White British patriotism. In my own comment to the Cat’s eloquent piece, I pointed out that the British imperial forces not only included Whites, but also non-White servicemen and women. They also included Chinese labourers. These served with honour alongside their White comrades, but it is sadly only in the last decade or so that their contribution to the War has received the recognition it deserves. In the early part of this century the former Empire and Commonwealth Museum in Bristol staged an exhibition on non-White servicemen in the First World War. Radio 4 has also broadcast a programme about the Chinese labour force, whose own role in the conflict has really on just been recently rediscovered. Dominiek Dendooven, of the In Flanders Fields Museum in Ypres, Belgium, also gave a presentation in a seminar the archaeology department of Bristol University some years ago on ‘Multicultural War in Flanders’. This covered the material remains of the non-White troopers and labourers, and the trench art they produced during and after this most terrible of wars. Sarfraz Manzoor tells the story of the 1.27 million men from the Indian Army who fought alongside British troops in every major battle from Ypres to Gallipolli – a fact almost completely overlooked in the history books. On the centenary of the outbreak of the First World War, Manzoor redresses the balance, revealed through letters written home by sepoys – an expression for infantry soldier from the Perian/Urdu word – which were saved by military censors.